Rebbe Shaul Yedidya Elazar and some of Chassidim in America. 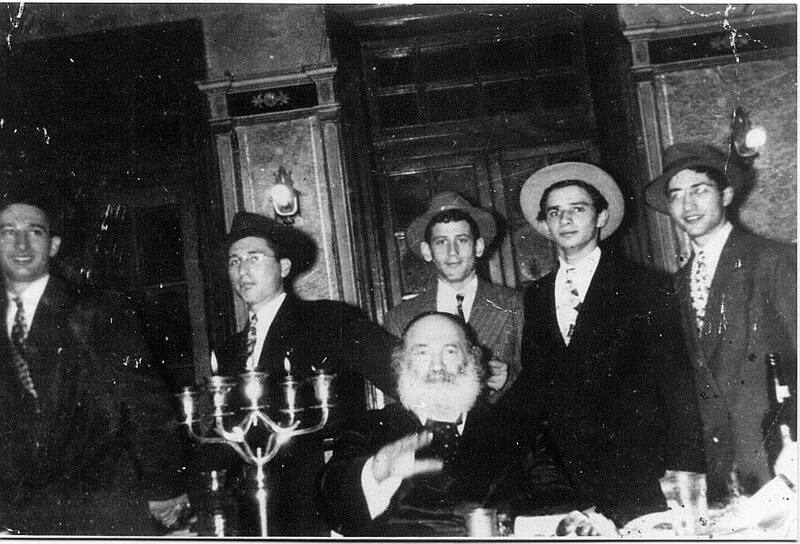 Second from the left is HaRav Ben-Zion Shenker. Tonight, the sixteenth of Kislev, is the 59th yahrzeit of a man who left his mark on the Jewish world in an extremely unique fashion. 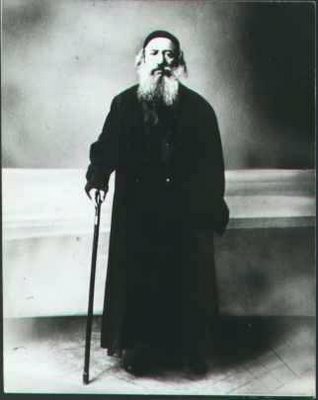 Rebbe Shaul Yedidya Elazar Taub Zt”l, the second Modzitzer Rebbe, known for his sefer, the Imrei Shaul, is remembered by Polish, American, and Israeli Jews with much respect and fondness, regardless of their level of observance. The Imrei Shaul was world-renowned as phenomenally gifted in both musical ability and Torah scholarship. He guided thousands of Chassidim in Poland, later in the US, and finally in Eretz Yisrael. 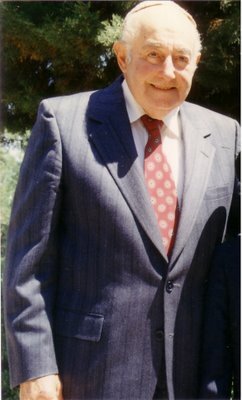 So much of his life was legendary - over ten thousand at his Tefillos on the Yamim Noraim; non-Jewish composers trying to furiously write down some of the notes from his stellar musical compositions during the davening; his miraculous escape from the Nazis across Poland, Lithuania, Russia, Japan and the US; rebuilding the Chassidus from near extinction in America and Eretz Yisrael; the only Rebbe allowed to lead a Tish in Vilna; interceding for freeing Jews while in the Far East and in the US - including the Mir Yeshiva; up until even after his petira [passing] - being the last Jew to be buried on Har HaZeisim [Mt. of Olives] the day of the UN Declaration for a Jewish State, and the war started. We introduced Reb Shaul to our blog last year, focusing on his Kah Ribon niggun. I would now like to focus on one poignant expression of his, which almost became the name of this blog. If I were to have my own shul or minyan, I would give it this name. 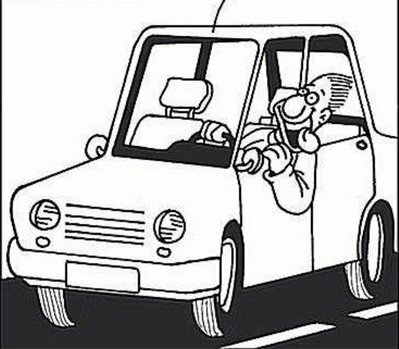 As we mentioned regarding the Divrei Yisrael, all of the Modzitzer Rebbes use/d Negina not only as a vehicle for Avodas Hashem (Divine Service), but as an integral part of it. This often amazed people, who couldn’t understand how one could place so much emphasis on Negina as opposed to Torah scholarship. In the Yishtabach prayer, we praise Hashem as "Habocher b'Shirei zimra," the One Who chooses song and melody. In the Birchos Haftorah [the blessings following the reading from the Prophets on the Sabbath], we praise Him as "Habocher baTorah uv'Moshe avdo" – the One Who chooses the Torah and Moshe Rabbeinu, his servant. Hashem is given the same title – "Habocher" – for both Torah and Negina. Moreover, Rebbe Shaul points out that regarding Torah, our relation to Hashem is one of servitude – 'Moshe avdo;' whereas with Shira, song, Hashem's Majesty is emphasized – "Habocher b'Shirei zimra, Melech yachid…" [a unique King]. This concept is best understood through a story which was heard from R. David Shternshuss of blessed memory. In 1935, Rebbe Shaul came to Eretz Yisrael for a visit. He spent a Shabbos in Yerushalayim, with the Tishen being held in the Chassidishe Shul in Batei Warsaw. 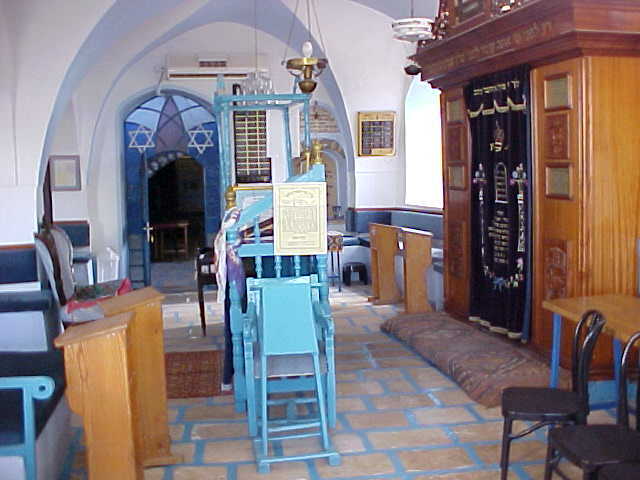 Rebbe Shaul entered the Shul, at the beginning of the Tish, and started saying Shalom Aleichem (in Modzitz the minhag is that Shalom Aleichem and Eishes Chayil are said without any tune, and Azamer B’Shvachin is sung during the meal). 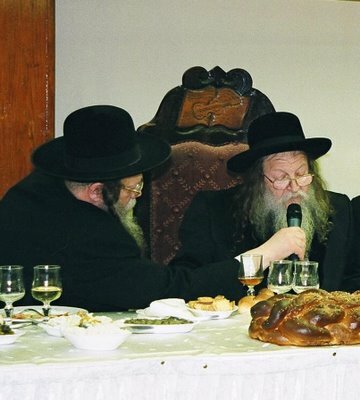 People started wondering, why isn't the Modzitzer Rebbe singing? Ribon Kol HaOlamim and Eishes Chayil were said without any tune, to the amazement of more of the people. After Kiddush and Hamotzi [the blessing over bread], the fish was served and Shirayim [remnants of the Rebbe’s portion] given out, a procedure that took close to an hour. The people quieted down, Rebbe Shaul cleared his throat ... and said Divrei Torah for three-quarters of an hour! Many people became discouraged, and quite a noticeable amount of people started leaving the Shul. At the end of the Divrei Torah, without any break, Rav Shaul started to sing Azamer B’Shvachin. People heard him quite a distance away and started running back to the Tish. Even more people came in then, than the people that were there at the beginning of the Tish. This pattern of a course of the Shabbos meal, long Divrei Torah, and Niggunim repeated itself throughout the Tish. As a writer described the Tish, it was hard to figure which was more important: Was the Niggun an epilogue to the Divrei Torah, or were the Divrei Torah a prologue to the Niggun? My thanks to R. Yehuda Nathan and Eliezer Weger for their contributions to this post. Zechuso yagein Aleinu v’al Kol Yisrael – May the Imrei Shaul’s merit protect us all! This is so hot that my fingers can hardly touch the keyboard! A new disk from the Modzitz Musical Heritage Machon has just been released. The disk contains all ten niggunim composed this year by the Rebbe Shlita for the Yamim Noraim (High Holidays). This "internal" disk, not for regular commercial distribution, features a Modzitzer choir ["Capella"] of men and boys, and high-level musical accompaniment, making it a near-studio quality production. It should be noted that at the Yahrzeit Tish on Sunday, some 150 copies of this disk were sold. While not giving a full review, I want to share some more information about this disk. As we mentioned, the Modzitzer Rebbes compose several new niggunim every year for the Yamim Noraim. Recently, two of these, usually a Kaddish and Slach Nah, are introduced at the first night of Selichos. Then on Rosh Hashana, several additional niggunim are introduced: Mechalkel Chaim, Simcha L'Artzecha, Kadsheinu B'Mitzvosecha, Areshes Sfaseinu, and others. [Sometimes another niggun or two is introduced for Yom Kippur as well]. This year, although the new Rebbe Shlita is in mourning, we were graced with ten new niggunim. In fact, one of them the Rebbe Shlita composed on Rosh Hashana itself, and introduced it to the Chassidim at the Tish on the second day of Yom Tov. So briefly, this disk has ten niggunim, some of which are lively dance tunes [Kaddish, Simcha L'Artzecha, Kadsheinu, V'Havieinu]; others are dveykusdik [Slach Nah, Mechalkel Chaim]; waltzes [Areshes, Halleluka]; and one long Tish niggun – Heyei Im Pifiyos, which is beautifully sung for close to twelve minutes! Most of the other tunes are 3-1/2 to five minutes each. The choir harmonizes beautifully, and the musical accompaniment is very tastefully blended with the singing. The disk is about one hour of pure listening pleasure! 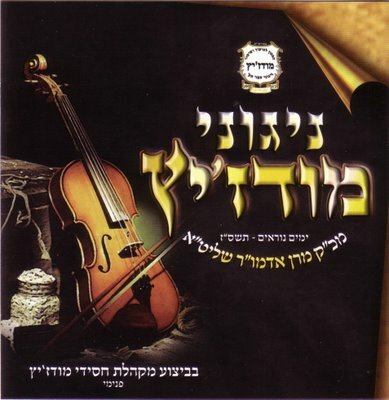 Those in Israel who wish to purchase copies of this unique and highly enjoyable disk can contact R. Yitzchak Krimelovsky at telephone 052-764-1308. The disk will be sold in the Diaspora as well. I can help facilitate your order if you e-mail me your name, address and phone number. I would greatly appreciate your feedback on this disk, once you have listened to it, either in the comments section or by e-mail. As we mentioned earlier, today is the 13th of Kislev and the 86th yahrzeit of Rebbe Yisrael, the first Rebbe of Modzitz, known by the name of his sefer, the Divrei Yisrael. 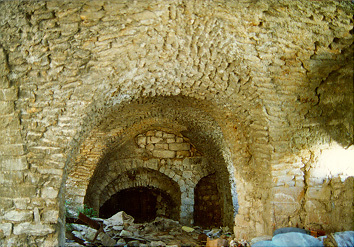 Rebbe Yisrael is the recognized innovator of using Negina not only as a vehicle for Avodas Hashem (Divine Service), but as an integral part of it. He was the composer of many dozens of famous niggunim, remembered and sung even a century later, with the most famous one being the Ezkera HaGadol, which we wrote about last year. Someone once asked Rebbe Yisrael of Modzitz, what is the nature of Negina? * Negina is the language of the soul, its sound and expression. The language of the soul is very concise. What one niggun can express, cannot be expressed with thousands of words. * It is said that the Chamber of Song [Heichal HaNegina] and the Chamber of Penitence [Heichal HaTeshuva] are close to each other, and I say, that the Chamber of Song is the Chamber of Penitence. * A person should not have an ear just to hear the songs of others, but also to hear the songs which sing from within his heart. * When I hear a song from the mouth of a Jew, I can ascertain how much fear of G-d there is within him and whether he is wise or foolish. When he lived in the town of Modzitz, the Rebbe would travel every day to the outskirts of town, to be refreshed with the crisp, clean air there. Once he was passing through a pasture field, and suddenly heard a shepherd singing. He asked the wagon-driver to stop the carriage, so that he could hear the song of the shepherd. When the song finished, he continued on his way.